The Marks To Prove It five-piece will play an extra date at London's Alexandra Palace. 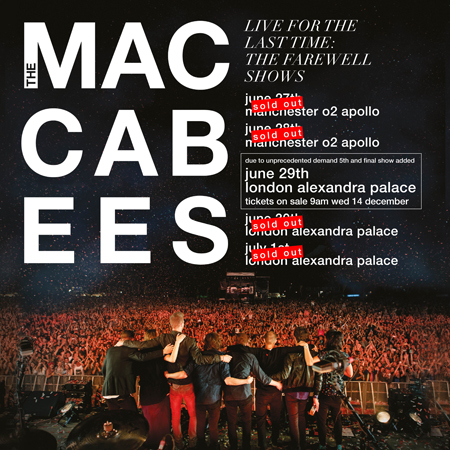 Due to unprecedented demand, The Maccabees have added a fifth date to their 2017 farewell tour. After announcing shows in Manchester and London respectively, the Marks To Prove it outfit have now confirmed they will play a third and final London date at Alexandra Palace on Thursday 29 June 2017. This will be followed by two sold-out homecoming gigs at the iconic north London venue. Tickets go on sale on Wednesday 14 December from 9am. Announcing their split back in August, the Love You Better band revealed they would "not be leaving the group behind as a divided force".